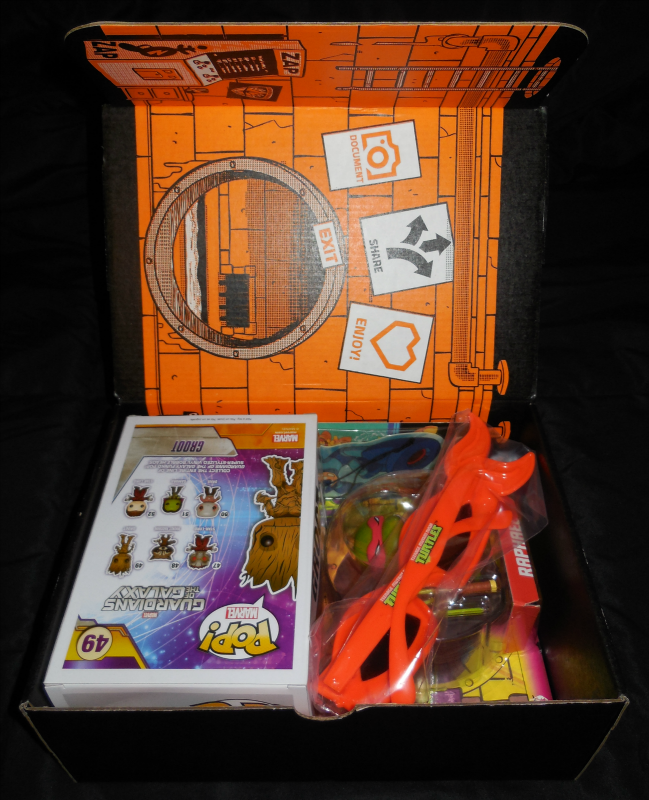 The Marvelous Misadventures of Madam Geek: Can't hate Loot Crate! Since I first laid eyes on that beautiful bounty of nerd goodies, I’ve wanted to acquire my very own Loot Crate. This month, I equipped my Amulet of Mara and committed. Allow me start by saying that Loot Crate appeals to the frugality in me. Roughly $20 (including shipping) for $40+ worth of assorted geeky items? Yes, please! In addition to the already fantastic price for the budget conscious, a promotion code for a discount is ever present that can be found on their facebook page. My experience started when I ordered the August Crate on the last possible day for orders. With my order placed on the eighteenth, I received tracking information the next day. As lightning fast as that was, it arrived two days later! I felt as though Barry Allen had hand delivered my goods. Now for the goodies! As I popped open the box, I laid my eyes upon the epic loot drop that fall before me. First impression: Guardians of the Galaxy and Teenage Mutant Ninja Turtles!? Loot Crate wins all the internets! The art on the inside box is spectacular and fits the items perfectly. Though it doesn't appear to have much more than those few things. To quote Thorin about that last part: I have never been so wrong in all my life. So much is packed within this tiny box! 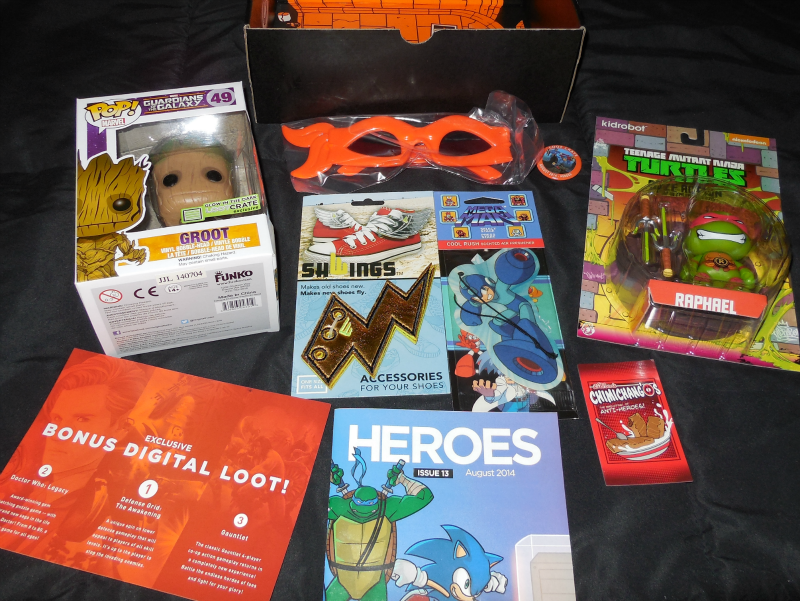 Loot from the August Crate: A Loot Crate exclusive glow in the dark POP figure of Groot, Kidrobot Ooze Action glow in the dark Teenage Mutant Ninja Turtle figure, TMNT glasses that resemble the masks worn by the turtles, shoe accessory called Shwings, Mega Man air freshener, Deadpool cereal box magnet, digital download codes for in game loot, a Loot Crate pin, even a booklet with information about Loot Crate and the items within it! Overall, Loot Crate exceeded my already heightened expectations. The exclusive Groot figure alone was worth the price in my opinion, but the total of these items well exceeds $20. An additional perk to Loot Crate is that it contained things that I enjoy but did not know existed, or might not go out of my way to find. Last but not least, information. I will post the website for Loot Crate here; however, I will ask, pretty please with glowdust on top that if you order that you use my link! I would greatly appreciate it. Additionally, use this promo code to save $3 off your first month's subscription: save3. The only thing left to say is: Woot for Loot!